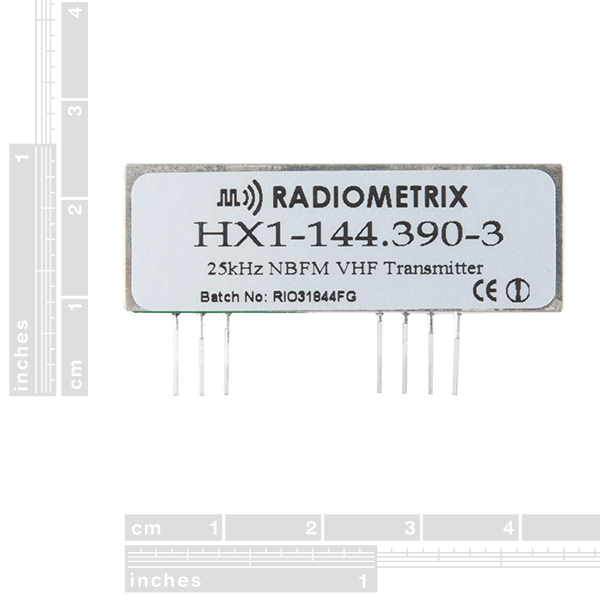 The HX1 is a low-power amateur radio transmitter set to a fixed frequency of 144.390 MHz. 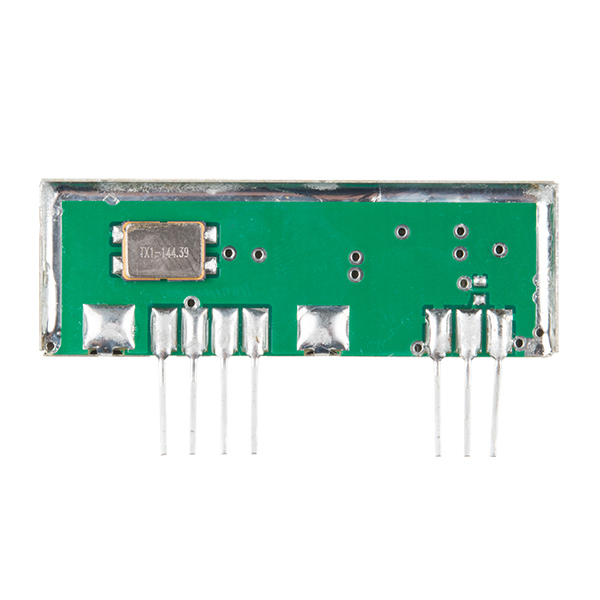 In North America, this frequency is used for the Automatic Packet Reporting System, or APRS. APRS is a standard used by amateur-radio operators to broadcast live sensor data on a shared frequency. This data can be received by anyone with the proper equipment, and is aggregated on the internet through gateways run by members of the APRS community. APRS is commonly used to share real-time data including vehicle location (GPS), weather stations, high-altitude balloon tracking, remote sensor platforms, disaster relief coordination, and more. It’s effectively an open-source, open-data, community-run, free to use, IoT system with potentially worldwide coverage. 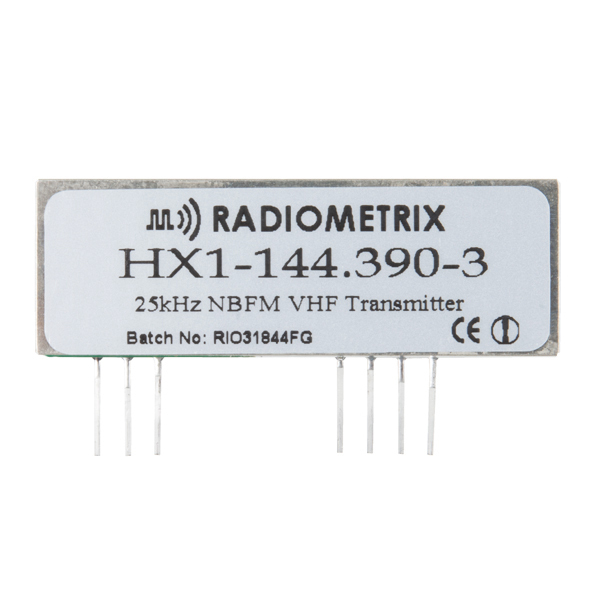 The HX1 is a 5V, low-power (300mW), narrowband (3kHz) VHF FM transmitter module. With a simple antenna, the range will be around 6 miles. Since this is a "bare" transmitter, the data input must be properly modulated and formatted. There are several Arduino software packages that can do this, see the hookup guide for information. Note: Because it uses amateur radio frequencies, you will need an amateur radio license to use the HX1. It's easy (and fun!) to get one. 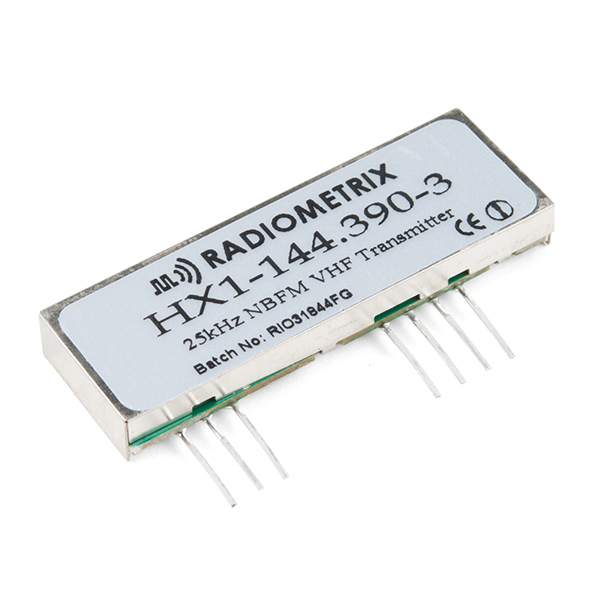 144.390 MHz is only used for APRS in North America, and in Colombia and Indonesia. Other frequencies are used in other parts of the world, so this module will not be suitable for use elsewhere. Sparkfun only sells the North American version, but Radiometrix (the manufacturer of the module) has other versions for Europe, Africa, and Australia. As a long-time Ham, and someone who very much supports SparkFun, I feel obliged to offer some words of caution. I'm sure that there are some "special situations" that this is a good solution, I fear that many may be disappointed with it. With only 300mW, it's going to have VERY limited range. Also, since it's ONLY a transmitter with no receiver, it will not be able to detect "colisions", so the data will be guaranteed to be lost in the event of any interference (received data aknowledgements will be ignored, and the lack of one will also be ignored). Also, thanks to the fact that it's fixed frequency means that it can't be moved to an alternate (unused) frequency, and for "short range special uses", getting onto a frequency where everybody isn't could be useful. (It would also help on making sure that your data which would likely be seen as "corrupt" doesn't get into the normal APRS channels. Sorry for the negative attitude towards this product, but my experience suggests that the potential user should evaluate carefully it's limitations. The ARRL (the national Amateur Radio club) has lots of info, study guides, and such to help get an Amateur Radio license. Does this unit have enough bandwidth to transmit the 202 AFSK clearly? I used to have a Byonics Microtrak that used an earlier version of the HX-1 and the 2200 hz tone was down about 12db compared to the 1200 hz tone. This limited the range to only a few hundred meters, much more than the low output power would suggest. An audio spectrum screen shot of the transmitted audio would be helpful. What are real-world data rates when using this? It's 1200 baud packet, but since we're talking about APRS, it's not really raw data rate that matters. If you're using the network appropriately you'll be moving less than 100 bytes per minute.